The Italian community is one of the most extensive and long-established communities in Soho. There had been a major influx of Italian political refugees to London in the 1860s and although the main focus for the Italian community was the area around Clerkenwell, many also settled in Soho. The Societa Italiana Cuochi-Camerieri (Italian Hotel and Restaurant Emplyees Benefit Society) was founded in Gerard Street in 1886 and after ten years was sufficiently well established to purchase the lease of 27 Soho Square. In November 1897 the society had 450 members, who were able to enjoy the benefits of their new club. Italian cooks or waiters seeking employment could register with the club. In the case of sickness members of the club were provided with medical advice and sick pay for a period up to six months. The decade following the end of the First World War saw a rapid expansion of the Italian community in Soho and by the mid 1930s many new Italian restaurants had opened, including Quo Vadis, Leonis and Quaglinos. Italian delicatessens became increasingly popular supplying a diverse range of popular new foods such as pasta and olive oil. 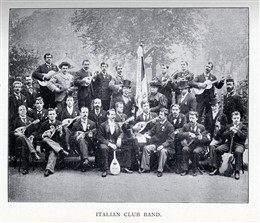 An Italian Club had been established at 4-6 Charing Cross Road in 1937 by the Italian Benevolent Society. It was the home of a variety of Italian organisations such as Associazione Nazionale Combattenti Italiani (Italian Legion), Circola del Littorio, Fascio di Londra, L'Italia Nostra and an employment agency of the Italian Culinary Society until the outbreak of World War Two. At that time the building was seized by the Custodian of Enemy Property. The war years were a particularly difficult time for the Italian community in Soho, with Italian restaurants being attacked in anti-fascist rioting and many Italian waiters being interned as “enemy aliens”. This page was added by Adrian Autton on 29/03/2010. 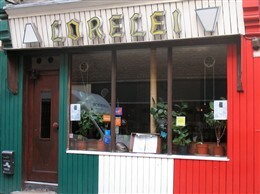 Hi Adrian Sorry to say the Lorelei's now gone too! Was going to eat there last week but all boarded up. Another one bites the dust.